For the past 18 years Pixie Windsor has been furnishing the homes of The District - adding vintage flair to temporary homesteads of politicians, revamping a family’s new row house or being the weekly stop for neighborhood shoppers. Miss Pixie's Furnishings and Whatnot on 14th street oozes life and vibrancy. It is no wonder that Windsor’s keen eye for art and love for finding that perfect piece has bled into her own home. 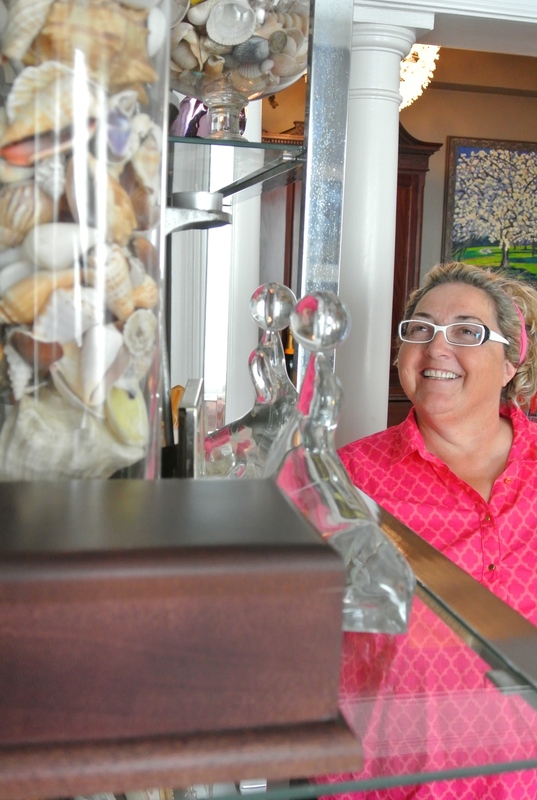 Her upbringing on the Eastern Shore of Maryland has influenced a lot of styling in her home - from the large jars of seashells in her bedroom to the sweet diminutive pink shade that runs throughout her home. This simplistic beach house vibe gives a fantastic backdrop for her love of Outsider and Folk Art to standout. Pixie has been collecting pieces from her travels to New Orleans including a repurposed metal lamp and a chair made entirely of belts! The vintage knick-knacks juxtaposing classic sleek design and understated wall colors makes Pixie’s home the ideal place for both peace & play. Being surrounded by different vintage styles at the store and auctions each week my style really envelops many eras! It’s definitely eclectic and quirky mixed with Hollywood regency. There are midcentury pieces and of course rustic country thrown in too! I love New Orleans! My travels there have brought back some amazing artwork and fun inspiration – including a chair made of colorful belts and a lamp from recycled silverware! I’ve been so inspired by Southern homes growing up, the classic touches and soft color palettes which make the perfect background for all of my funky finds. My childhood friend, Joseph Paul Davis and his gorgeous design aesthetic have played a big part in my style choices as well. My overwhelming and ever growing art collection gathered throughout the years! Needless to say owning a furniture store makes it hard to commit! I fall in love with so many pieces and have a tendency to try and squeeze it all in or switch them out a lot. It is hard to rein it in and not to say, “YES!” to every sweet pinup print or gorgeous pink cane back chair! A friend recently referred to my home as “Hotel Windsor” It is definitely a great entertaining space and I love hosting parties! It is quite comfortable and relaxing with plenty of unique treasures for guests to wander & find. In 7 years I have not been able to decide on the right dining room table! You can’t imagine how many I’ve gone through! My highly organized closet! The Container Store is my saving grace with the Elfa shelves. Everything has it’s own place – there’s hat forms for the hats, shoe racks for the shoes and a bit of art thrown in to keep things interesting! My bed. A big comfy bed is so important to me because I don’t get much time to sleep so when I do I want it to be the comfiest place! Also, my drapery - I’ve never had window treatments before this apartment! I think even when purchasing functional pieces be sure you love them. Nothing in your home should be something you hate. And if it has no functionality but you love it – make it work! I kind of have my dream source! My auctions have everything I’m looking for and millions of surprises in between. Mitchell Gold – they have the most beautiful couches!! All artwork framed by Framesmith D.C.